We are delighted to team up with Cadburys to share with our readers some fun Easter activities for families to do over the Easter Holidays. Cadbury carried out some interesting research, that us Brits love to spend time with our friends and families over the Easter break with nearly two-thirds sharing that this is their favourite thing about the Easter holidays, followed closely by having time off work and eating Easter chocolate "that's defiantly me". Although most of us love spending time with the family one of hardest things we face is having a lack of inspiration when it comes to keeping the family entertained over the holidays. So Cadbury is providing families across the nation with fun and easy tips and tricks with their fun downloadable Easter activity packs, from cool craft ideas.Easter Egg Hunt tip and tricks, Recipes ideas, everything you could possibly need to keep the family entertained this Easter. 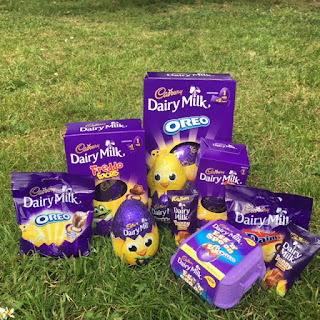 We printed off the downloadable Cadburys: Easter Fun At Home Activity Pack. The Cadburys activity pack contains everything you need this Easter holidays, from arts and crafts, easter puzzles, and outdoor games. My son is really enjoying the puzzles and word search. We couldn't wait to have our very own Easter Egg Hunt, it's something that kids and adults like myself love participating in, well who doesn't want to find a delicious Cadbury Chocolate Egg right! Easter just wouldn't be Easter without a Cadbury Chocolate Egg. We couldn't wait to start our hunt.so we downloaded the Cadburys: Easter Hunt Pack which has all you need to get started, from fun bunny ears and paw prints to make a paw print clues. We opted to use some of the pre-made clues from the pack and made some of our own clues, it was great fun hunting around looking for an egg, having your own egg hunt is great fun, the best part is that you can make up the rules to suit your family or simply just opt for a fun relaxing hunt. My son initially had an idea, to give each of us 30 seconds to find as many eggs as we could during that time, it was great fun but rather exhausting. Each year Cadburys teams up with the National Trust to offer families a fun filled day out, The Cadburys Easter Bunny collects his eggs from the Bournville factory, and fills up his basket with delicious Easter treats, he then delivers the Cadburys products to over 300 Cadburys Easter Egg hunts being held across various locations leading up to Easter. Find a Cadburys: Egg Hunt near you. 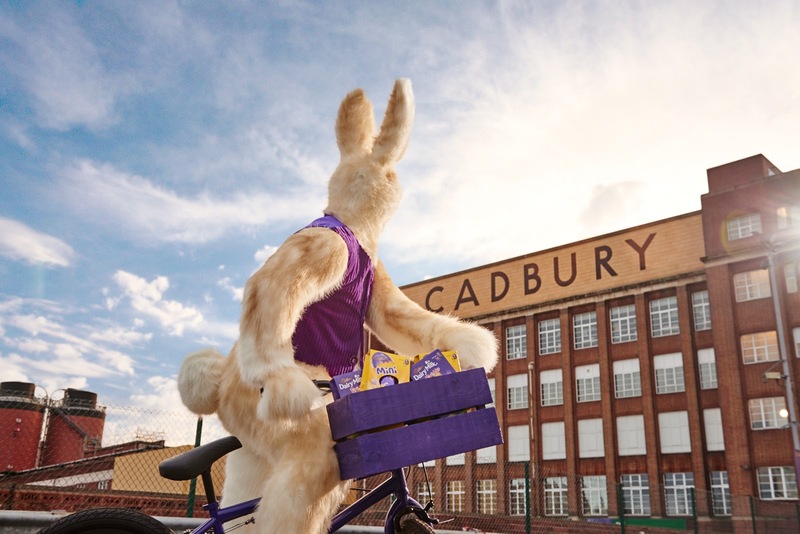 That is 10,625 Cadbury Easter Eggs made per hour… and 177 per minute! If you stacked every Cadbury Easter Egg made at Bournville every day on top of each other you’d have a tower of Cadbury Eggs as high as 98 Eiffel Towers’, 76 Empire State Building’s, 305 Big Ben’s, or 11,590 Sultan Kosen’s – the tallest man in the world! 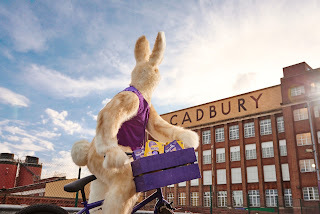 The first Cadbury Easter egg hatched onto the production line back in 1875. These Cadbury Easter eggs were made of dark chocolate with a plain smooth surface and filled with dragées, sugar-coated chocolate drops. The earliest decorated eggs were plain Easters enhanced by chocolate piping and marzipan flowers, a far cry from the exciting varieties now available on shelves! Cadburys has some tasty new products on offer this Easter as well as our all time favourites treats, Cadburys Mini Eggs are the perfect size for an Easter egg hunt. Cadburys has a delicious selection of Easter Eggs, which are perfect for an Easter Egg hunt and for Easter gifts for the family. These tasty Easter treats can be found in all good supermarkets nationwide from as little as £050p so there is defiantly something to suit everyone's taste and budget this Easter.